We thought that when it comes to AI and processing tons of data, any overhead would be multiplied by a large factor (maybe several thousand fold). As a result, we decided to write the low-level (everything that is connected with data representation and the board state) in pure C.
* BoardInfo – This contains data that does not change during the whole game: board parameters: width/height, field structure, etc. * BoardState – This contains data that changes during the game: current set of pieces on board, number of pieces in reserve for both players, etc. Our AI thoughts are based on evaluation of a large quantity of board states (for example, if we use Alpha-Beta pruning), so we absolutely need to use simple 'memcpy' to copy them and the fastest operations to operate with them. That's why the data organization above and pure C were chosen. Here comes Objective-C and high-level wrappers of the two classes discussed above. AI uses low-level model only to make decisions about what is the “best move.” In all other cases, high level model objects are used (even to make the move, which was just evaluated using low-level structures only). HexBoardGame – This class contains inner variables of type BoardInfo that do not change during the game. It also contains an inner variable of type BoardState, which is changed every turn, as well as initialization functions. Everything that is needed to create a game skeleton from board parameters (BoardInfo) and changing board states (BoardState) is also included in this class. 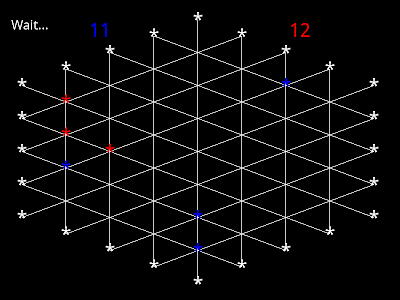 GipfBoardGame – This contains the specific implementation of HexBoardGame for iGipf rules. It expands HexBoardGame with such things as moves with pieces shifting (see the rules), row removal (see the rules), etc. Here,we think everything is clear. Everything is even clearer here. CCScene -- is a class from Cocos2d. Enough for today. These drafts helped us to understand what we are going to implement and how to start the basic coding routine. The next interesting step will be AI experiments for which we need a proof-of-concept; but we'll talk about that tomorrow. We appreciate any type of feedback. If the process of "open development" is interesting enough we'll continue share our results almost "live". I lol'd at the first post. I hadn't heard of GIPF: http://en.wikipedia.org/wiki/GIPF_(game) -- sounds like fun. Your architecture is probably massively overcomplex for a game like this. 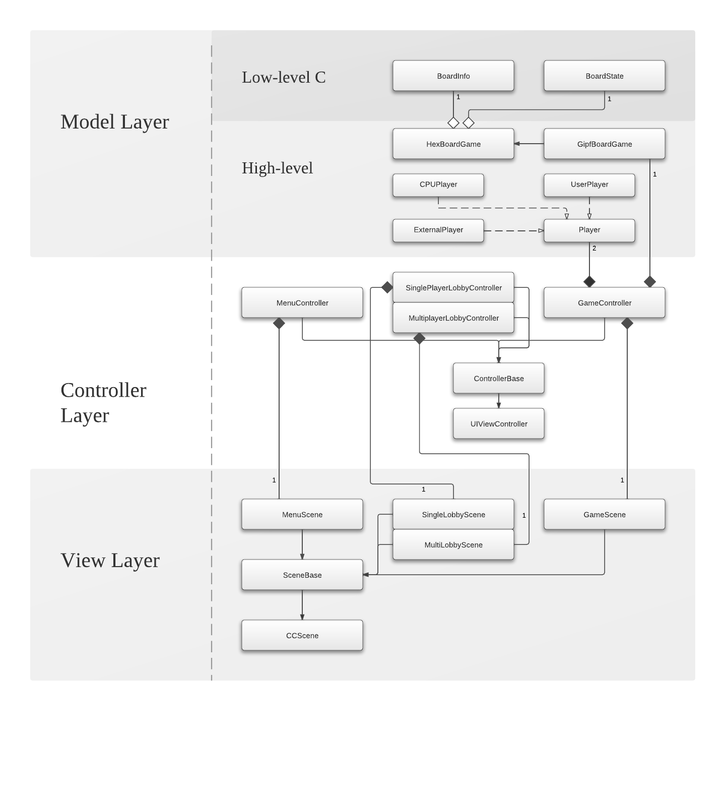 In short, it is just two parts: low-level C for fast AI calculations and high-level Objective-C with classical MVC with view-controllers for each scene. I would build this application with all the code in 1, maybe 2 classes. You're looking at <<10k LoC in total so anything more is almost certainly overkill. If you're going to stick with this, we could put it as an article series on site. yes we're going to write our developer's notes during the whole process. Today we’re writing about the AI part. Hopefully a bit of theory will be useful. We’re developing a turn-based game with zero-sum play ( if someone wins n-points, second player loses n-points). 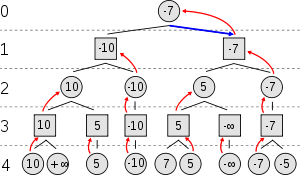 The whole game can be represented as a tree with min-levels where one player tries to minimize possible loss and max-levels where second player tries to maximize gain. Imagine that the max player (circle) is considering his next turn. If we expand all of his turns, then all of his opponent’s turns that come after his turn and continue to do so, we can get the tree as above. Look at level 4 - it’s min turn, we compare all possible outcomes and propagate minimum value to the level above (3). 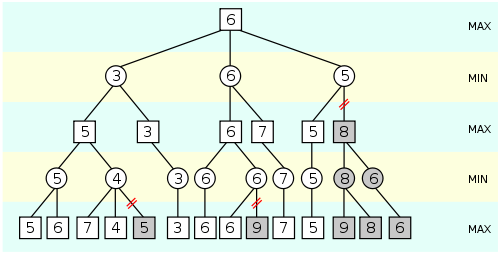 10 is less than +infinity, so 10 goes to third level, 5 and -10 have only one possible turn in their sub-branches, they are propagated as is, 5 is less than 7 so it is propagated, and so forth. This brings us to level 3. It’s max turn. We compare each possible outcome and propagate max for every sub-branch, just as we did going from level 3 to level 4. We repeat this pattern again and again and again unless we reach top level. So, the value of game is -7. Absolute value doesn’t mean anything so far - it’s just a cost of game according to rules that we defined. If both players are rational than min player will lose 7 points and max player will win 7 points; so far so good. It’s a pretty simple solution, isn’t it? Nevertheless, let’s look at our case: we have 24 edge points and 42 possible ways on each level (actually even more - some turns require an extra-step). Just by simple math we know that on the 4th level we’ll have 42*42*42*42 ~3M leaves, by the 5th level this count is already 130M. And don’t forget that we’re working with mobile phones, not super-computers. It seems as though we’re in trouble, but this is where alpha-beta pruning comes to help us. The idea is pretty simple. In real trees we can skip some branches, because they don’t give us a better solution. Look at the right branch on level 1 (consider top level as 0) - it’s min turn and here we have options: 5 and 8 -- in reality we never need to expand the 8 sub-branch because we already know that it doesn’t provide any benefit to the min player when compared to branch 5. Hence, we can prune 8-branch. That’s the idea behind the very simple and very efficient algorithm called: alpha-beta pruning. Note: 4% and 9% means that pruning saved us about ~ 96% and 91% of calculation times. Of course the real evaluation function doesn’t return pure random values, but we suppose that that result will be pretty similar. Our plans are to complete the move engine over the weekend. Looking at a few board images found via google, it seems you may be able to prune 50% of the tree by taking advantage of board symmetry, although maybe only for the first few moves. PowerMacX, sure, we consider this ability to save a bit computation time during first moves. While weekend work (this post is a bit late, sorry for that) is in progress right now, we have to confess something. Even though we did not have any iOS code written before the project began, we did have small prototypes implemented in python. This prototype gave us confidence that the project could be implemented in 2 weeks. Even though we lost a couple of days of work on prototypes in scripting language, it was really useful to see the work in action. Indeed, it raised important performance issues and led to our decision to implement part of the game in pure C. But everything is good in its season. The Python prototype was first a console script of 300 lines; basically just game logic (with some restrictions such as remove selection if many rows are subject to simultaneous removal). Later we added some GUI elements (otherwise it was very frustrating and uncomfortable to play from command line) for which we used the kivy framework for those who are curious. It was our plan to try to run it under the Android OS and check performance on mobile hardware. This is already a good candidate for the AppStore, isn’t it? Just kidding! The good news – The game worked and we can play, though it was not so convenient. The bad news -- By looking 3 levels deep, the game needed about 1 minute for analysis. Through simple profiling we realized that most of the time was consumed by copying (cloning) boards for the next move and performing all operations with hexagon rows. We should mention that analysis to a depth of 2 levels is enough for newbie, but for an expert analysis needs to go at least 4 levels deep. Okay, as we see, performance is a serious issue if we deal with AI calculations on the object-level without special optimizations. Thus, the current goal is to create a layer of the highest possible performance to use 100% of the calculation capabilities of the iPhone/iPad. We believe that we could seriously beat our high-level Python implementation, because most performance in the Python prototype is lost on allocations and constructing objects (instead of memcpy to preallocated space). We expect something like a 10x improvement; but we'll see. Last time we talked about AI and alpha-beta pruning and we can now happily report that the AI work is done! We haven’t written anything about evaluation function yet, so we’ll cover that today. Now, in a more advanced version we can build a heuristic, such as evaluating the number of rows that can be removed in 1(2, ...) move, key position points occupied and so forth. Right now, however, we don’t use any of them and with good depth of search they are redundant. Even with 4 parameters, writing an evaluation function isn’t such an easy task. After all, what should be considered the stronger position: 10 pieces on board + 2 in reserve or 2 pieces on board + 10 in reserve? In which case does adding 1 piece give more power? 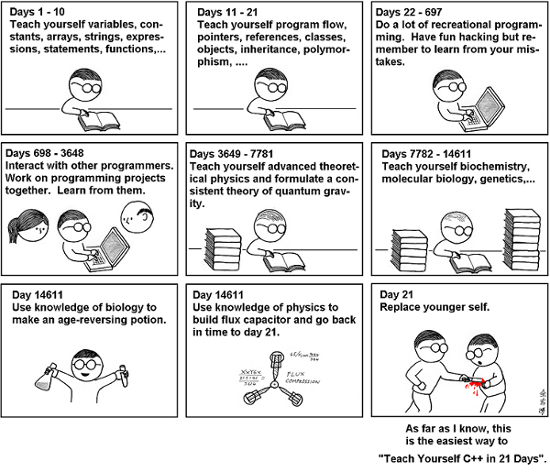 Unfortunately, we aren’t gurus of gipf theory so we need other way to figure this all out. 5-levels AI vs 5-levels AI played over 200 turns! This probably isn’t going to be one of the more disputed points in this process, but we stilled ask ourselves if pure C as it worth it? Certainly, yes! Our python prototype started to lag at depth level 4. We had to wait roughly one minute or so for an AI move at that level. Basically, allocations\copies took too much time and processing power. In our C version, with no heap alloc, struct memcpy-only, and optimized calc code, a depth level 4 analysis took roughly a second (~0.6 s - 1.2 s). In other words, we got a 60-fold increase performance improvement by using pure C, which made the game more friendly for users (User will wait a couple of seconds, not minutes). So the answer is a resounding yes; going with pure C was worth the effort. Another topic we want to cover here is unit-tests. Playing with an evaluation function and watching how 2 AI players interacted, we were able to discover some bugs. Yep, we aren’t perfect. Thankfully, we planned for our imperfections when we decided to add regression testing and spent a couple of hours adding the ability to set up any game scenario and execute AI based on that. In just 2 days we already had about 20 tests. About half of them caught bugs and other half were related to restrictions we constructed to save us from another dozen of bugs. Of course, with AI it is almost impossible to expect accurate, perfect moves in the middle of the game, but in the end of the game some moves are 100% precise. As an example, consider that player has only 1 piece left, his optimal strategy is to remove his pieces lest he lose. This was not always how the AI played, which led to a few bugs in the end of the game. Before wrapping up, let’s look at our current status. Our next step is multiplayer mode. Imagine our delight when we read that, “in iOS 5, Game Center has a new API that makes it easy to create turn-based games”. Upon learning this, and then looking briefly at the API, we decided to change the minimum supported iOS version to 5.0 and use this functionality. This API is supported even on 3GS model iPhones and it really shouldn’t be a big deal that our game won’t work on models that are already almost 4 years old. So, the turn-based games API sounded like exactly what we need! Unfortunately, problems began to pop up from the start. Initially we wanted to limit the time per turn to ensure the game was dynamic. As you might already guess, there are no such functionality in API. That was frustrating, but after a long discussion we agreed that because the game requires thinking and planning, maybe a time limit wasn’t most important feature. Eventually, the joy gained from clear victory won through mental prowess is much more fun than a victory gained by default through timeout. In addition to this benefit, we also realized that dropping timeout limits would allow a player to engage in many matches simultaneously. We decided that using the Game Center API for turn-based games was still worth it. So resolved on issue, but the net reared its head in less a moment. When you create a new match, you get to play the first turn right away (even if the system hasn’t found an auto match partner yet!) When the system has found someone, he can see your turn. There is currently no other way to initiate a game and though it looks pretty strange, that’s how it’s implemented from Apple’s side. A player creates a game by sending his or her first turn, which acts as a flag that the game is started and tells auto-matcher to consider the player as candidate for playing. So, players must be aware that if they make their first turn in auto-match mode, that doesn’t mean they are already playing with someone. As an aside, it is worth noting that match maker takes about a minute to pair 2 players. Also, even if one game is waiting for a player and another player clicks “auto-match”, which you think would, ideally, pair that player with already created game, Game Center sometimes creates new game instead. To say the least, testing interaction with this black box is a very tricky task. Ok, you probably think we have already mentioned most of the possible problems with Game Center and the answer to that thought is …”No, not really.” The next problem arose with notifications that occur in the background. Imagine, you are playing a game and switch to another application, spend some time there, and then get a notification that your opponent made his turn and so you switch back to our game. It seems relatively simple, but when we tested this scenario, lo and behold, nothing happened. So, the game is active, everything is ok, the game moves to the background and the notification arrives (at least at the system iOS level - and you can see it) but the game knows nothing about it. That’s it. It seems that 3-4 seconds after the game goes to the background, all listeners are disabled. That’s probably ok to prevent battery drain etc, but when you switch back to the application it should (why not?) deliver all notifications, but in fact it doesn't. This is a very frustrating problem and we now need to re-implement all game-initialization (recreate the whole game state) logic every time the game emerges from the background, just to proceed to the next turn. Despite all of the complaints above, it’s still cool to test game. Even though there have been some minor issues, we’re already almost done and are very excited about delivering the application soon! The two weeks are over and so is our story. You can see the final result in screenshots below. After looking at result of our work, we can say one thing. There is nothing scary about writing an iOS game. Yep, iOS requires coders to change some programming approaches. Sometimes you can’t understand why the heck it should be done a particular way, but that’s ok. The most difficult part of the whole process was our lack of experience in working with certain libraries (APIs). For example, we twice changed our version of cocos2d. The first time we selected a stable version, but it had a couple of issues connected with texture coordinates positioning. So, we switched to a beta version. The second change was our error in that we encountered a memory leak with sprites and thought, after a small investigation, that it could have been due to using the beta version of cocos2d. Thus, we updated the version again. However, the memory leak did not go away and we later found an error in our code. Another problem is working with scenes directly in code. When you have one resolution supported it’s probably ok, but with 4 resolutions it’s already a nightmare. Now, CocosBuilder beta release went to open source and we definitely will consider it in our next projects. The next consideration for developers is graphics and sounds. Don’t be afraid to outsource everything you can’t do as soon as possible. It’s very frustrating when you have to wait because you hesitated to outsource something and thus can’t speed up a process. So, just do it in the beginning of a project when you’re still pretty comfortable with your own deadlines. By the way, don’t be afraid of tough deadlines. Frankly, it motivates. What’s next? We completed everything we had planned for the first version. Of course, it’s not ideal and we have many ideas about what can be improved. Should there be interest in the game, we will integrate those improvements. The final version has 120 files and 10870 lines of code (with empty lines and comments). The application has been submitted for review, so we can rest a week or two. Thank you for all of your comments. If you have any questions, we’ll do our best to answer them. We hope to see you guys in multiplayer mode!